This week, the Bill & Melinda Gates Foundation released its annual Goalkeepers report, which tracks the progress toward achieving the United Nation’s Sustainable Development Goals. This edition focuses on the impact of growth of young populations on the future. 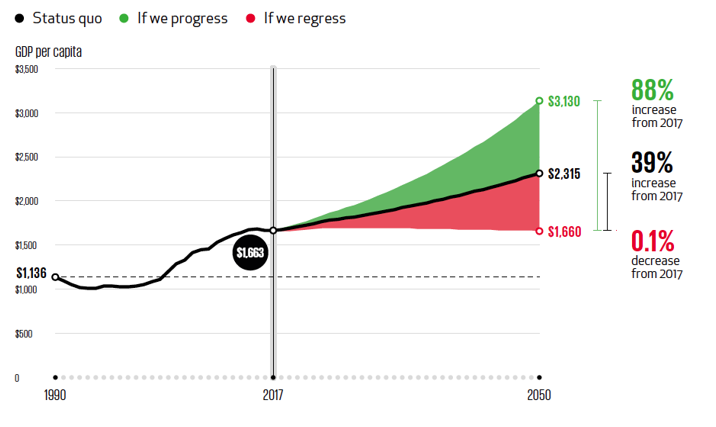 Looking at several indicators, the report studies development prospects based on potential scenarios: progressing, regressing, or maintaining the status quo. The report states that by 2050, 86 percent of the world’s extreme poor will live in sub-Saharan Africa, notably amplified by population growth. Even with a reduction in the share of poor people, the aggregate number of poor people is likely to remain relatively high. This post explores the growth of Africa’s young population and the need for human capital investments. As seen in Figure 1, by 2050 Africa’s young population, i.e., those aged between 0 and 24 years old, will increase by nearly 50 percent. 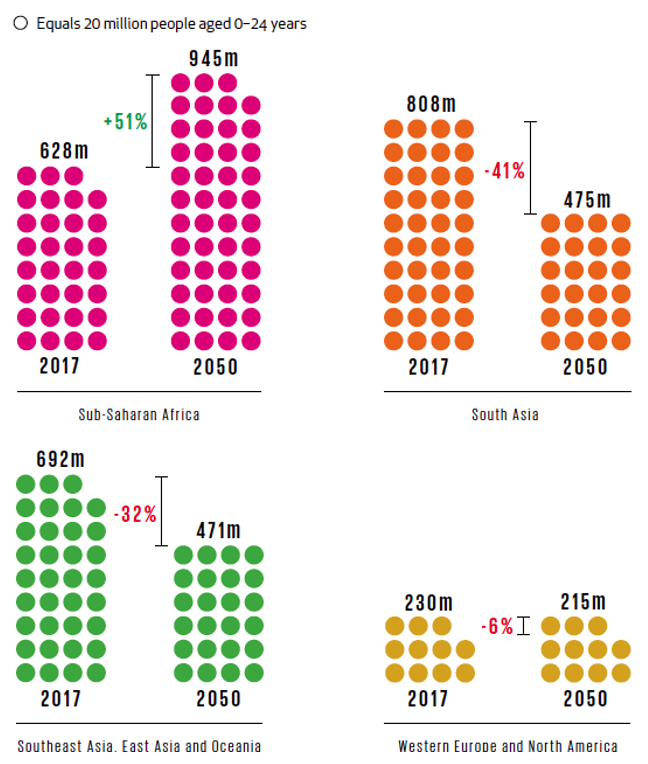 In 2050, the continent will have the largest number of young people, making up nearly twice the young population of South Asia and Southeast Asia, East Asia, and Oceania. As young people are set to represent an important share of the continent’s population the report warns against the risks that can arise if the young population is not given the opportunities needed to improve their lives. The report cites the risks of insecurity, instability, and mass migration; however, it praises young people as the innovators, leaders, and workers of the future, stressing the importance of investing into young people’s health and education in order to unlock productivity and innovation, thus reducing poverty. The report states that investing in human capital has been pivotal in the prosperity of emerging economies and urges African countries to seriously consider bolstering human capital investments. Though estimates state that GDP per capita will see a 39 percent increase by 2050, if human capital investment remain unchanged, said investments—specifically those in health and education—can trigger an 88 percent increase in GDP per capita, by 2050. If Africa’s human capital investment fails to match its population growth, the report predicts a 0.1 percent decrease in GDP per capita. With a growing number of young people, the report urges African countries to focus resources toward its young populations in order to avoid seeing them fall in a poverty trap, which could in turn breed insecurity and instability.